The Laconia Incident changed the way Germany treated prisoners of war and was even brought up at the Nuremberg Trials. However, the American prosecutors were left embarrassed when the full details emerged. This tragic series of events took place when the British troopship RMS Laconia was sunk by German U-boat U-156 off the coast of West Africa in September 1942. The ship was carrying 2,732 crew, prisoners of war, passengers and soldiers. It was built in 1921 as a civilian ocean liner and was requisitioned to help with the war effort. 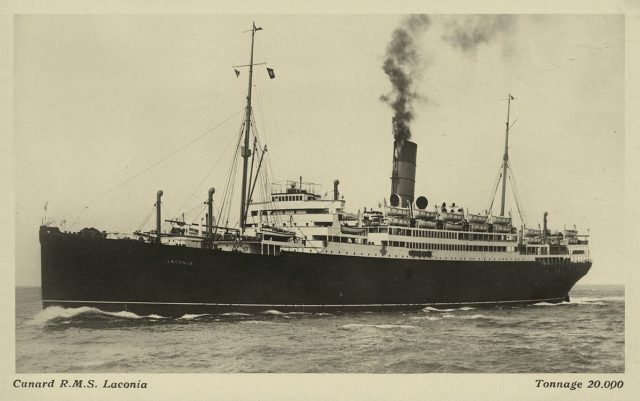 By 1942 the Laconia had been converted into a troopship, and at the time of the incident, she was sailing from Cape Town, South Africa to Freetown in Sierra Leone. Captain Rudolph Sharp, had previously been in charge of the RMS Lancastria, which had been sunk by Germans in French waters while evacuating British and French nationals two weeks after Dunkirk. Just before midnight on September 12, 1942, U-156 was stationed off the coast of West Africa, between Liberia and Ascension Island. The Laconia was seen as a legitimate target because it was armed, which excluded it from being warned before an attack. At 10.22 pm, the ship transmitted a signal advising they had been attacked by a submarine, although it is unclear if the message was picked up by another vessel. The high death toll occurred despite regular drills being carried out in evacuation techniques. There were plenty of lifeboats on board, but heavy listening due to the damage caused by the submarine meant that half of them could not be launched until the ship had settled. Cunard Line postcard of the RMS Laconia circa 1921. Under the decks, chaos reigned. The Italian POWs were left locked in the cargo hold as the Laconia went down. They tried to escape by breaking down the hatches or by climbing ventilation shafts. Several were shot. Some were bayoneted to death by their Polish guards, who carried rifles with fixed bayonets but no ammunition. The situation for the POW’s did not improve even if they managed to escape from the hold. Only one life raft left the ship with any on board. Those in the water were shot or had their hands cut off with axes if they tried to climb onto a lifeboat. The blood attracted sharks, who started a feeding frenzy. Once the Laconia had gone down, the captain of the enemy submarine Korvettenkapitan Werner Hartstein commenced rescue operations. Over 2,000 people were struggling in the water, among them women and children. Hartstein also broadcast his intentions over open radio channels so that all Allied forces in the area would be aware of his humanitarian actions. Nuremberg Trials. Defendants in their dock, circa 1945-1946. Karl Dönitz Karl is first on left, second row. Picking up survivors U-156 placed them on the foredeck and began traveling under Red Cross banners to Vichy French ships to transfer them. Several other German U-boats joined in the rescue efforts. Incredibly, seven of those U-boats were diverted by Admiral Donitz from a planned surprise attack on Cape Town. The Admiral then told his superiors in Berlin about the situation, which enraged Adolph Hitler. He ordered Donitz to send the boats back to Cape Town as per the original plan. U-156 picked up nearly 200 survivors and had another 200 in tow in four lifeboats. Hartenstein broadcast a message in English informing all shipping in the area that he had picked up survivors of the sunken ship. However, the British in Freetown did not believe him and feared it was a trick. The submarine remained on the surface for the next two days and was joined by three others. After the four had collected as many survivors as possible, they headed for the French warships which had set out from Senegal and Dahomey to meet them. While they were en route with the survivors, a United States Army Air Force B-24 pilot spotted the procession and reported the fact that they had survivors of the Laconia sinking on the foredecks of their submarines. Their callous commanders ordered them to attack anyway. The B-24 pilot carried out his orders and killed dozens of the survivors with bombs and by conducting strafing attacks. 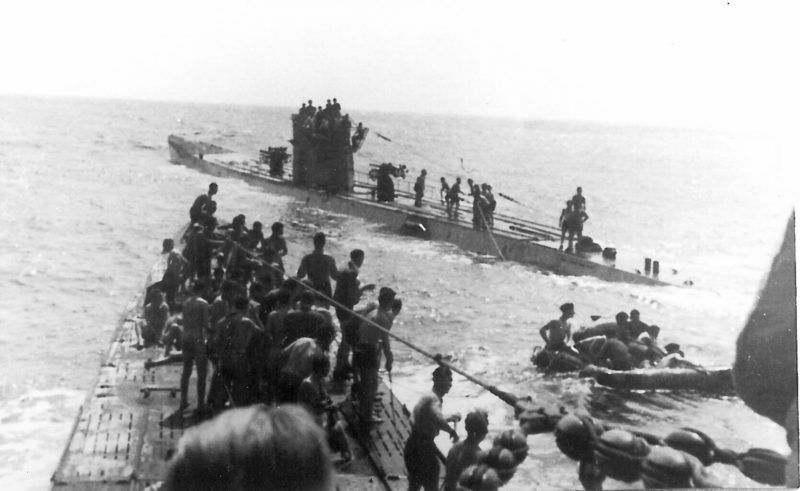 It forced Hartstein to order his sub to crash dive to avoid being destroyed and cast off the survivors in the process. The US aircrew mistakenly reported they had sunk the sub, and received medals for their bravery. 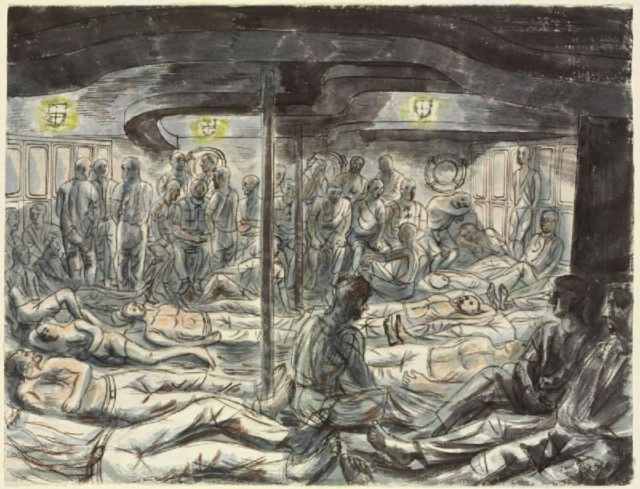 Rescued British Sailors, Soldiers, Airmen and Merchant Seamen – on the French warship Gloire by Edward Bawden. 1,113 people were eventually rescued by other vessels in the area while 1,619 died; mainly Italian prisoners of war who had been under guard below deck. The Laconia Incident had consequences that reached far and wide. Until then, U-boat commanders had assisted the survivors of ships they had sunk with water, food and medical care. However, in response to the incident, Donitz issued an order forbidding U-boats from rescuing survivors. 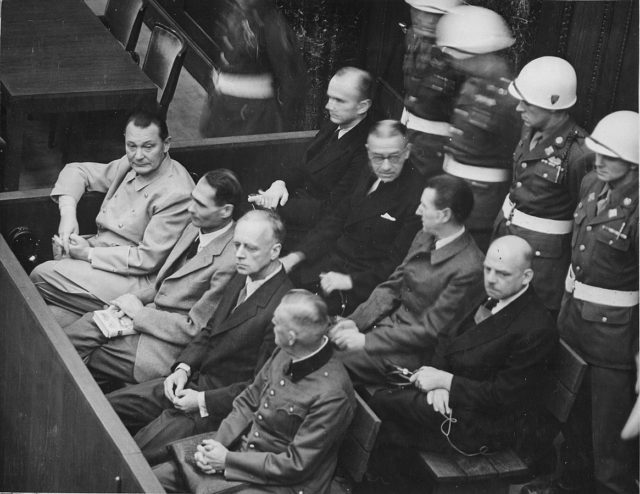 After the war at the Nuremberg Trials, Donitz was indicted for war crimes including issuing the Laconia order. It backfired as evidence was produced showing the Allies had acted callously in much the same circumstances and that the Americans had practiced similar tactics from the start of the war. Far from confirming the cold, black hearts of the Nazis, the Laconia Incident exposed the humane side of German commanders. It also showed that sometimes the good guys are guilty of doing evil things.